We have chosen St. Augustine Grass and Zoysia Grass as our grass species of interest. Both species grow in the Dallas area. In the first project We are studying the response to water stress at several levels using a systems biology approach. We are currently using RNA-Seq to determine genes that are up- or down-regulated during water stress, metabolomics to determine metabolites that are up- or down-regulated, and proteomics to investigate protein levels. We are also correlating these changes to the physiological state of the plant. The methodology for the second project includes four specific aims. 1)Which WRKY genes regulate responses to water stress? We are adding two turf grass species to add to our large data sets from soybean and tobacco in order to identify additional drought responsive WRKY genes that are potential regulators of drought responses. 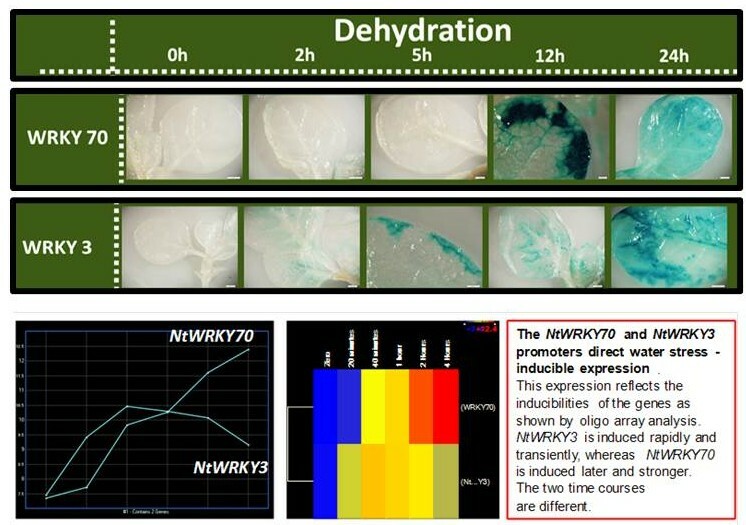 2)Do phylogenetically similar WRKY genes regulate water stress responses? Our hypothesis is that orthologous genes may have similar functions in drought responses in different plant species. We already have considerable data on this objective and are contining to investigate this with a combined phylogenetic tree of WRKY genes from soybean, rice, tobacco and a turf grass species. For clades that contain candidate drought response regulators we are extending the analysis to conserved protein domains outside the WRKY domain using MEME. This translational biology approach is particularly valuable for plants where transformation is difficult or where large amounts of genome sequence and/or EST data is lacking. 3) Do drought responsive WRKY genes share similar drought responsive promoter elements? It is possible, that similarity between drought response regulators lies in the promoters of the genes. We are testing this hypothesis by comparing drought responsive WRKY promoters for conserved motifs. 4) How do WRKY transcription factors regulate drought responses and can we use them to increase drought tolerance? We already have candidate WRKY genes in rice, tobacco, and soybean and this is now being extended to the two trufgrass species. We are validating these genes as drought response regulators by knockdown/overexpression coupled with expression profiling, ChIP-seq, biotin streptavidin pulldown assays, yeast two-hybrid assays and mutant analysis. This is revealing target genes of the WRKY transcription factors and providing additional gene targets for improving water stress responses. The third project is a promoter project, genes with promising expression characteristics have already been chosen from soybean and tobacco and similar genes are being identified in both turfgrass species. About a dozen promising promoters have been tested as promoter:reporter constructs in both systems of reduced complexity (soybean hairy root and tobacco BY-2 cells) and also transgenic plants. This is being expanded to include dissection of promoters to discover promoter elements that are both necessary and sufficient for driving the expression characteristics. In addition, a small number of new synthetic promoters are being constructed, consisting of defined elements. The aim of these synthetic promoters is to produce improved promoters that are better than native promoters at driving transgene expression. This combined in silico and transgenic approach will yield a new toolbox of useful promoters for biotechnological purposes.